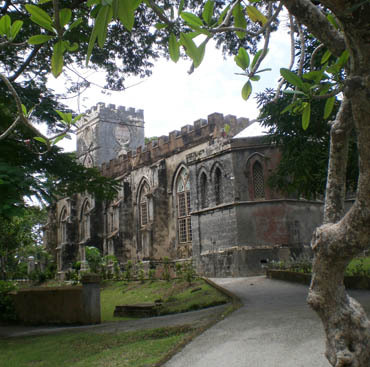 Malvern in Barbados is a township on the border of St John and St Joseph parishes a short distance from the Eastern coast. Here Malvern, a former sugar plantation of some 315 acres (1913), survives. It lies on a 250m plateau behind Hackleton's Cliff on similar latitude to Bridgetown, which is on the west coast. The principal building is the original plantation house, known as Malvern Great House, with the ruined sugar processing works opposite. The house is substantial and dates back to the early days of colonisation by the British. There is a remarkable hurricane shelter tower at the rear with walls three feet thick. Also there is a water drip, used in ancient times for purifying water. Nearby is signposted Malvern; it being a small township of modest residential properties. Such a township would have been the tenantry in earlier times, where single room huts were designated chattels and would be dismantled and moved with their slave occupants to and from the plantations. 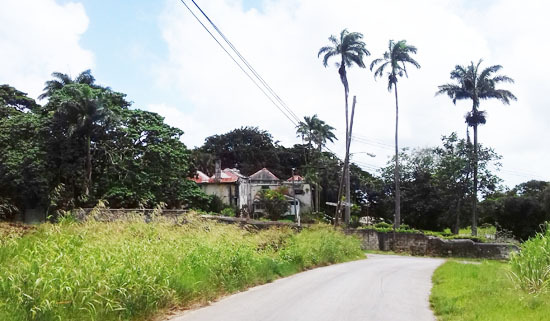 Today the plantation is managed by the Barbados Agricultural Management Company and historic debts were cleared around 2015. Today the Malvern Great House includes just two and a half acres of land. Bridgetown was once a major international port for slave traffic; the largest such port in the British Empire. Now it is a bustling principal town of the island that was until the 1960s part of the British Empire. 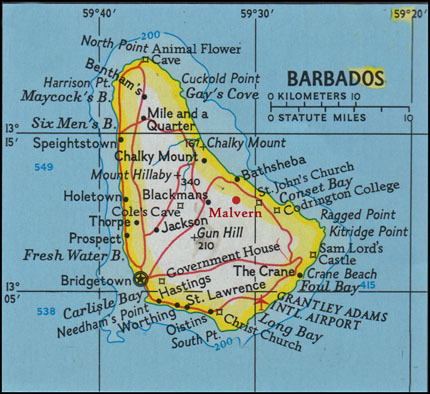 Barbados was originally discovered by the Portuguese. It was the English who claimed it however and settlement began in 1627. By 1642 sugar was the lucrative crop with a world market. Initially Irish and Scottish labour was extradited to staff the plantations becoming bondservants. However the climate and environment resulted in a short life expectation and African slave labour was imported to grow the sugar in the fierce equatorial climate. Stocky built slaves were preferred. 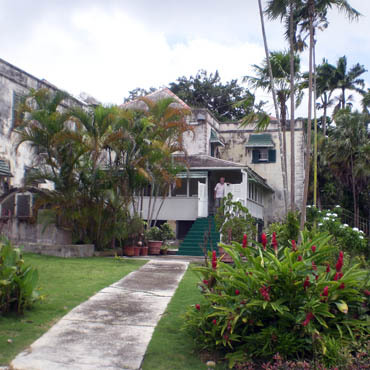 Ownership of the Plantation can be traced to before 1652, it being one of the earliest plantations established on the island. In 1652 Richard Ellis's executors, following his death, transferred the plantation with 25 bondservants and 2 slaves to Seth Rowley. Thereafter it became known as Rowleys until renamed as Malvern in the early 19th century. In 1656 the plantation changes ownership again to Edward Binney, a local merchant. At this time it amounted to 195 acres. St Johns Church near the plantation dates from 1645. In his will in 1701 Edward Binney bequeaths the plantation estate to William Gallop but by 1721 it is owned by a person named Hill. 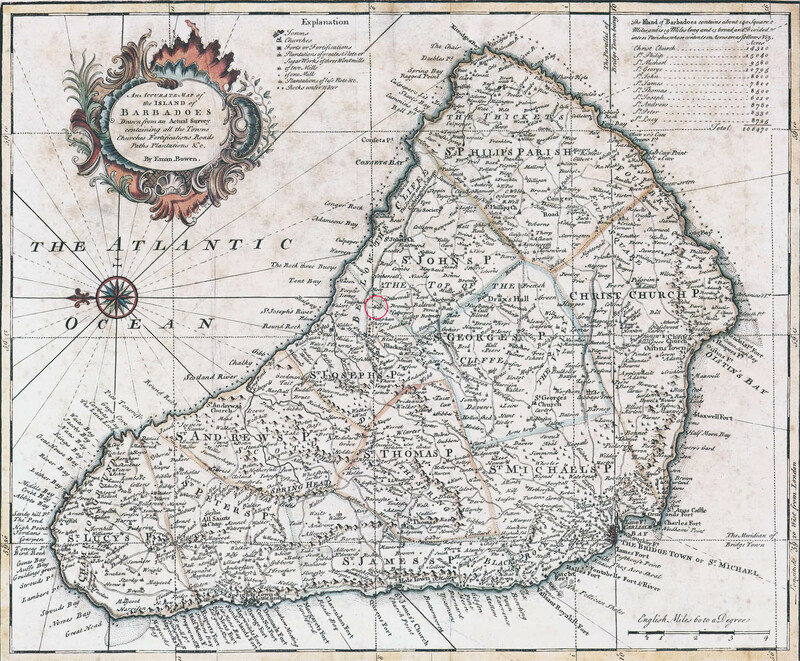 An early map of Barbados, dated 1747, identifies the estate as Hill. Click here to view 1747 MAP with the location of Malvern Plantation encircled. John Hill owns the plantation in 1741 but by 1778 it has passed to John Stewart, a practitioner of physics. In 1802 Stewarts executors then sell the plantation, described as Rowleys, to Francis Shorey Bayley (1757-1808). It was valued at nineteen thousand pounds and comprised 314 acres. It was this family that originated the name Malvern for the estate. Francis Shorey Bayley had previously been manager of an adjacent plantation called Springhall. Six years later, Bayley's son Francis Souper Bayley, inherits the estate from his dead father in 1808. The inventory of the estate in 1808 makes no mention of Malvern. The son was about 18 years old at the time and was embarking on an education in England. He matriculated to Oxford in 1808, securing a BA degree in 1812 and a MA in 1815. It is suggested that about this time the name Malvern was introduced, based on the son being schooled in Malvern England. The first school in Malvern, England was built by Lady Apphia Lyttelton of Madresfield Court in 1814 and so casts doubt on this reasoning for calling the plantation Malvern. When the son inherited the plantation, the inventory included those enslaved being 31 men, 42 boys and 37 girls with 313 acres of land. Above: Bayley seniors memorial in St Johns Church. Below: Bayley the son's memorial in St Johns Church. The son, Sir Francis Souper Bayley (Dec.1789-1824) progressed in his career achieving a knighthood in due course. By 1817 the plantation name is recorded as Malvern(e) in legal documents and the 1825 map of Barbados records him as the owner of Malvern including his title of "Sir" as well as identifying Malvern as a location. Unfortunately at the age of 34 years the son passes away in Penang and the Malvern plantation passes to a relative the Rev. William Henry Ricketts Bayley. 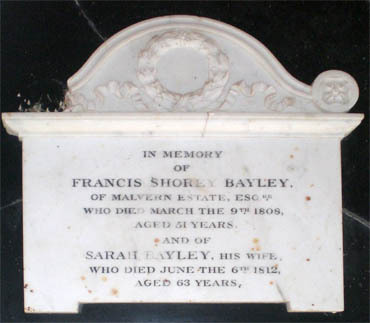 Both the Francis S Bayley's are recorded on memorial plaques in St Johns Church nearby. 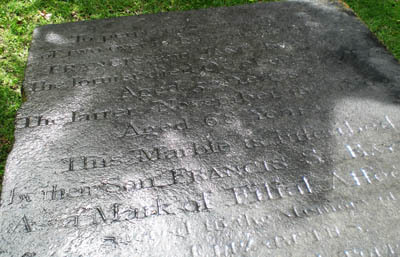 Also in the churchyard is the tomb recording the earlier 18th century generation of the Bayley family indicating that they are an established Barbadian family. Moving forward in time, the 1846 map of Barbados clearly shows the Malvern plantation and in 1860 it changed hands again to one Thomas Lyall and then by 1865 to Nathanial Forte. History was made again in 1912 when the ownership changed yet again. This time it was secured by C Millar Austin. He was the first black owner of any plantation in Barbados. This was in spite of emancipation that dated back to the 1830s. He had previously lived at Eastmont Plantation and was a blacksmith by trade. He recognised that the wooden wheel with the iron band could not take the strain of the uneven surfaces and was a heavy cost to the Sugar Industry. He developed the iron wheel and patented it and it was adopted internationally. 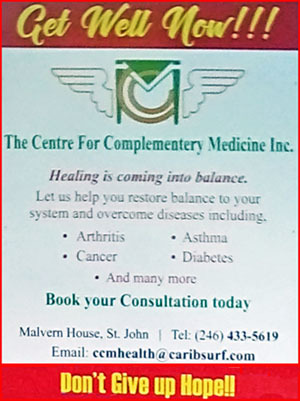 Today the Malvern Plantation House is a Centre for Complementary Medicine. This was founded by June and Herbert Cheesman. The house and garden is owned by June Cheesman who with her husband purchased it in 1991 from the Austin descendants. Much restoration was then carried out on the house, which itself had been extended and enhanced over the centuries. Essentially Georgian of uncertain date, it includes many traditional plantation features and decorations, giving it an air of great longevity. Speculation suggests that the core of the house is likely 17thcentury. Nearby the arched stable block, albeit in ruins, has an interesting sea-horse crest at roof level. This all raises the question: why was the plantation named Malvern sometime between 1808 and 1817? The son Sir Francis Souper Bayley inherited the estate from his father. Both gentlemen have memorials in St Johns Church nearby, together with an outdoor inscribed tombstone of the earlier generation of what was clearly a local family. 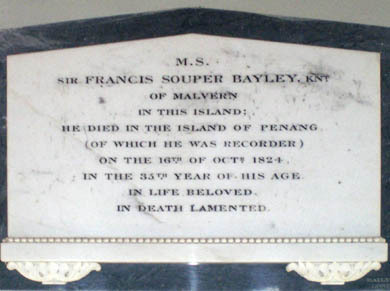 None of the family, particularly the son Francis Souper Bayley is known to have any direct connection with Malvern, England. The father however was previously manager of the adjacent plantation lying to the north called Springhall. The 1825 map indicates seasonal stream valleys and springs in this area. In addition Hackletons Cliff running north-west - south-east along the coast closely resembles the Malvern Hills in England when viewed from the sea shore. Perhaps Francis Souper Bayley stayed in Malvern, England during his term time breaks at Oxford? Were these physical characteristics of the landscape the motivation for renaming the plantation Malvern? We can only speculate. Map of 1825 showing the seasonal spring valleys to the west of Malvern and the Hackleton Cliff to the north. On the map Malvern is spelt Malorrn; this is assumed to be a typesetters error as the proper spelling is applied elsewhere. The Centre was opened in 1994 by the Hon. David Thompson, late Minister for St John. The Centre's aim is to educate the public in Natural Healing through Lifestyle Changes, Food Supplementation and Exercise, and to show that good health Is attainable by all. Excellence in Quality and Service is the hallmark. On the 6th March 2019, Malvern Great House celebrated an open day in conjunction with the Barbados National Trust. This was an occasion when a Mulberry Tree was planted in the grounds. The Mulberry Tree had arrived in 2018 from Malvern Melbourne Australia and was a sapling taken from the tree that was planted there in 1959. The Australian tree was in turn a cutting from the Mulberry Tree that George Bernard Shaw planted in 1936 in Priory Park, Great Malvern, England to celebrate his 80th birthday. This tree had blown down in a storm in the year 2000. The planting of the new tree in Barbados was attended by 326 people and was the result of a gesture of friendship by Malverns Worldwide. 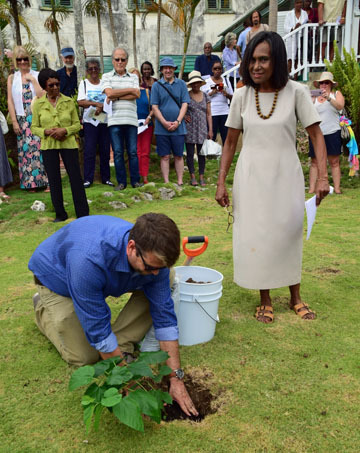 In the picture, June Cheesman at the plantation house stands by Miguel Pina, the Manager of the Barbados National Trust at the planting ceremony. Letters of goodwill and congratulation for the event were received from Malverns around the world including Australia, South Africa and North America as well as a Proclamation from Great Malvern England. For more details on Malverns Worldwide click the logo below.